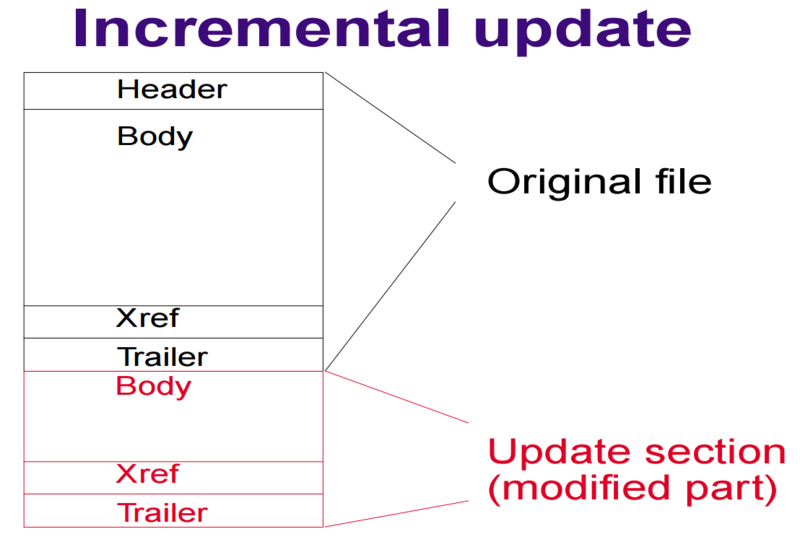 The contents of a PDF file can be updated incrementally without rewriting the entire file. Changes are appended to the end of the file, leaving its original contents intact. Make small changes to large documents faster. Changes appended to the end of the file, rather than the entire file being re-written. Minimize the risk of data loss when processing a PDF by appending changes to the original document at the end of the file rather than re-writing the entire file (alternative to this would be to just save a copy of original file instead of overwriting original — however, depending on circumstances this is not always possible). Incremental updates are required when modifying a digitally signed PDF. Any changes to the existing bytes in the file will invalidate existing signatures, so re-writing the PDF is not an option. The functions in Debenu Quick PDF Library which let you use an incremental update when saving PDF files is DAAppendFile when using the direct access functions and AppendToFile when using the regular functions. // PDF Library so we can use that without adding a new blank doc.